Quite possibly the most iconic piece of clothing in Mexico, the huipil (pronounced wee-pil) accompanies a woman through her lifetime—from coming-of-age, to marriage, children and death. These garments are functional works of art, and represent the storied histories of family legacies. They feature references to specific regions, indigenous groups, social classes, along with personal tales of creativity and human evolution. To make a huipil is to honour ancestral processes, and to wear one is to pay tribute to the incredible diversity of Mexico and beyond. A huipil is essentially a simple tunic of varying widths and lengths that is comprised of either one, two or three rectangular panels. These sections are sewn together by hand and feature an opening for the head and arms. The stitching can range from simple seams to ornate crochet work that is an art form in itself. The most common type of huipil is a shorter piece that is tucked into a wide belt over an ample skirt, however, longer varieties are also widely made and worn. Huipiles are typically woven on a portable backstrap loom, though different varieties are also made on standing foot pedal looms, and with a store-bought cotton cloth known locally as “manta”. Ancient populations in Mexico worked with materials from nature like tree bark and agave, however, new influences came with the Spanish. Elements like wool and silk were gradually incorporated into the local dress of various communities, and can still be found today. 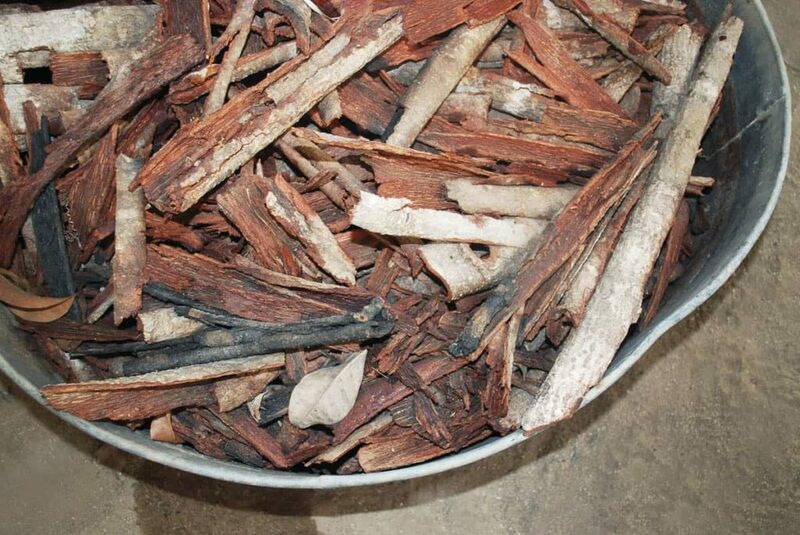 In the traditional making process of huipiles, natural dyes used to be quite common. Organic hues like cochineal and indigo were nearly as valuable as silver for use as trading commodities by the Spanish, and with this, these colours were typically reserved for nobility. 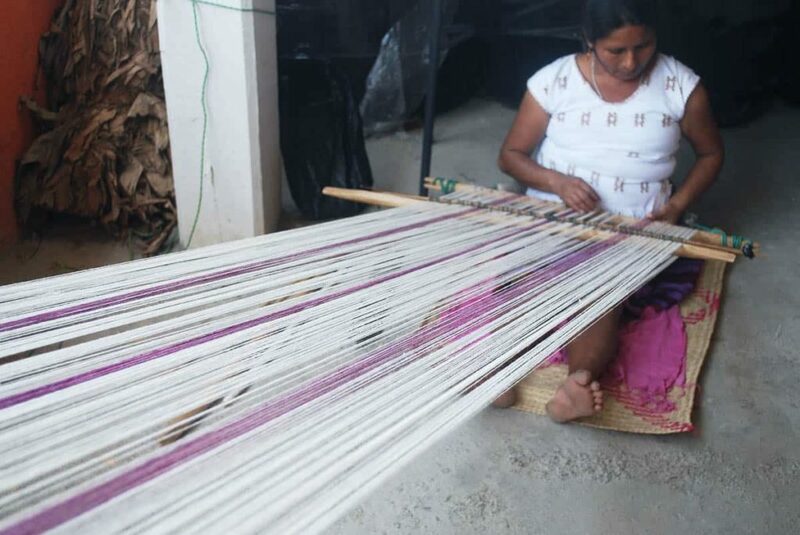 Natural dyes eventually waned in the face of synthetic colour options due to lower costs and production times, however in some regions of Mexico, the use of organic colour is still an integral part of the local culture. Mexican textile dyes are sourced from plants, tree bark, insects, nuts and the especially rare sea snail that provides a dazzling hue of pinkish lavender. The traditions and processes that are involved in creating a huipil date back hundreds of years, and are now largely maintained by the abundant indigenous populations that exist throughout the country. Within my home state of Oaxaca alone, there is a voluminous array of huipiles in daily life. They range from elegant striped versions made in San Juan Colorado from organic, naturally dyed cotton, to perhaps the most widely recognized design from the Isthmus of Tehuantepec – a matriarchal region of the state that layer heavily embroidered velvet blouses and skirts with ornate gold jewellery, and a colossal lace headdress. Throughout Mexico, and particularly in the Southern states, huipiles are simultaneously high fashion, everyday wear, and revered ceremonial garments, with more intricate versions typically reserved for special occasions. 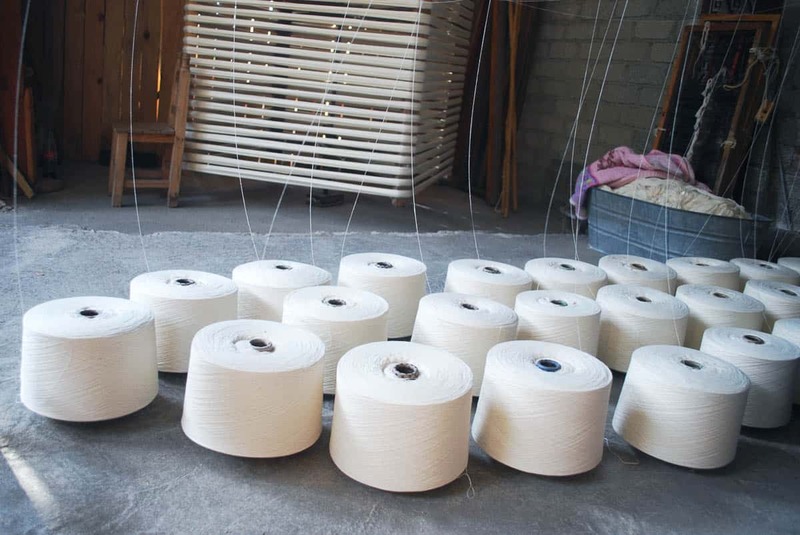 For some villages, the production of huipiles provides a positive stream of income for their local artisans, and in some cases, has invited a certain amount of fame to these locations. Located roughly an hour from the capital city of Oaxaca, the town of San Antonino Castillo Velasco is renowned for their embroidered masterpieces and is particularly famous for their handmade wedding dresses. These loose-fitting cotton huipiles showcase ornate floral embroidery work down the front and back of the garment, which can take anywhere from weeks or months to produce. One local maker recently showed me a piece of hers that took an astonishing six months to embroider. 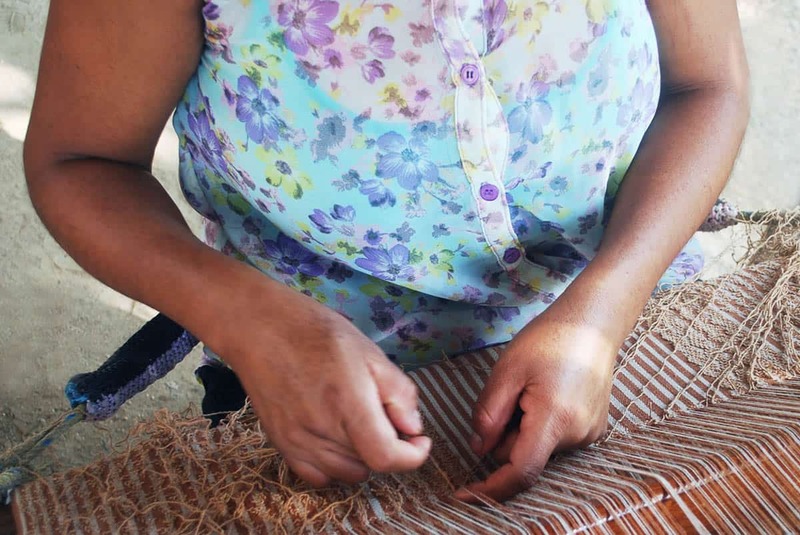 “My huipiles feature the types of flowers that grow in our village, and these textiles pay respect to the farmers who raise vegetables and flowers in our community,” notes Magali Mayra Aguilar Gonzalez, a third generation artisan from San Antonino Castillo Velasco. “I practice the knowledge that was taught to me by the women in my family, in order to honour them and to continue our traditions. I am proud to be an artisan, and also proud to be from my pueblo,” she says. 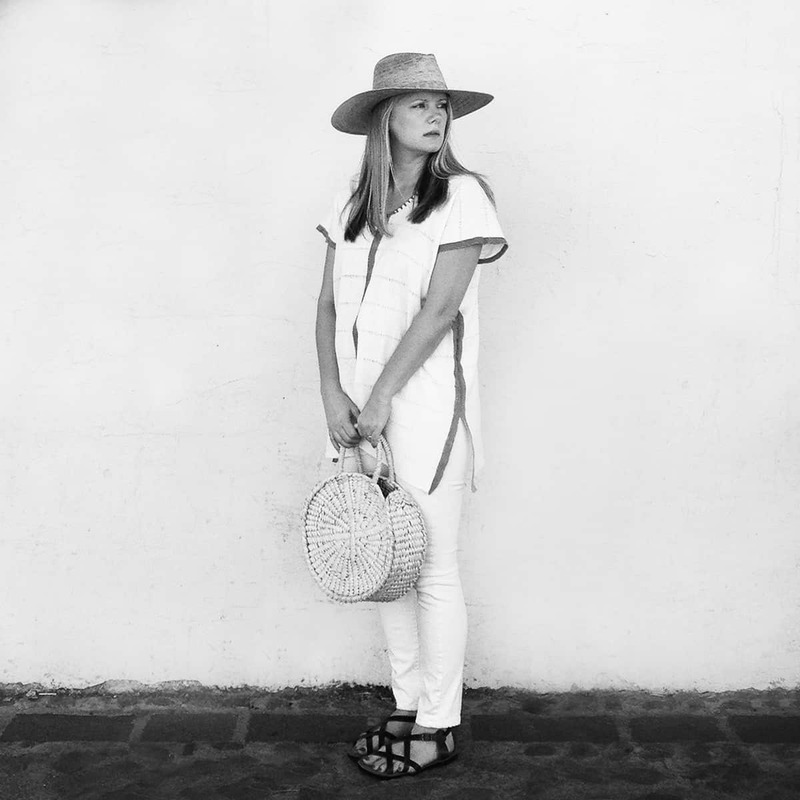 My own collaborations with local artisans aim to combine traditional processes and materials, with a minimalist, contemporary aesthetic that appeals to an international market. That said, I believe that this type of collaboration comes with certain responsibilities. Out of respect for the makers and their traditions, the designs do not deviate immensely from the originals. Patterns and colours are simplified, and the huipiles are created in a range of muted neutrals, however the heart of the piece remains the same. Our artisan partners work on both backstrap and standing foot pedal looms, with the latter providing faster turnaround times, more successful means of producing multiples, as well as the opportunity to produce a range of pricing that is more widely accessible. I feel that it is also essential to credit the artisans for their efforts by documenting and sharing the processes and history behind their work in a public forum. In addition to shorter pieces that can be layered over jeans or a skirt, we are also working on a line of one-of-a-kind custom wedding dresses. The intention behind this is to offer a selection of versatile huipiles that can work beautifully for a casual wedding, but could also be used later in everyday life. While I am Canadian, I wanted to show respect for my adopted home during my own wedding last year. With this, I was married in a handwoven cotton huipil by an artisan from Pinotepa de Don Luis—a pueblo of roughly 7,000 inhabitants that is located near the coast of Oaxaca. 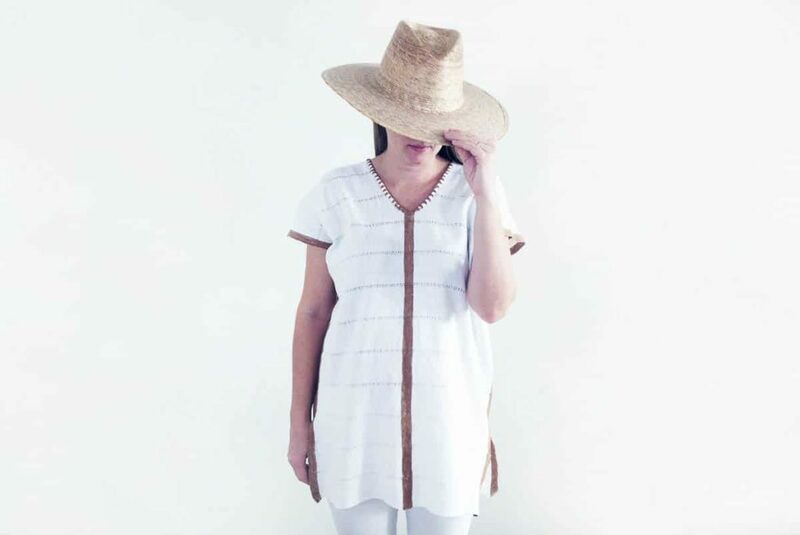 The makers in this community weave lightweight textiles on backstrap looms, with a special focus on the revered caracol-dyed cotton, and organic coyuchi—a local variety of cotton that grows naturally in delicate shades of camel, rust and green. My wedding huipil features three panels of hand-stitched white cotton with tiny figures of handspun coyuchi that represent the history of the area. In wearing this versatile piece, not only was I able to support the skilled and hardworking artisan hands of this region, but was also able to embrace my husband’s own heritage, as his family originally hails from the coast of Oaxaca. For me, this garment represents more than a simple wedding dress. It is a sublime culmination of the incredible creative history of Mexico that serves to support both the past and the future generations of makers.